Brimming with confidence after upstaging England, India would look to continue the winning momentum when they take on the West Indies in their second match of the ICC Women's World Cup, here tomorrow. The Indian eves could not have asked for a better start to the tournament as they stunned hosts England by 35 runs in their tournament-opener. The West Indies, on the other hand, lost by eight wickets to fancied Australia in their opening match. It was an all-round performance by India against England as they excelled in all three departments of the game. First the batters piled up a competitive 281 for three after being sent in and then the Indian bowlers bundled out the hosts for 246 in 47.3 overs. They were ably assisted by the fielders who effected four runouts. Openers Smriti Mandhana (90), Poonam Raut (86), Mithali Raj (71) and Harmanpreet Kaur (24 not out) all excelled with the bat to set the platform for India's total. On the bowling front, off-break bowler Deepti Sharma (3/47), medium pacer Shikha Pandey (2/35) and leg-spinner Poonam Yadav (1/51) returned among wickets to help India's cause. And come tomorrow, the Indians would expect a repeat show if not better against the dangerous Caribbeans, who will be desperate to register their first win in the tournament. For India, skipper Raj, whose first target is to make the semi-finals, is coming off a record-breaking seven successive half centuries, and she would look to continue in the same vein. Mandhana, who has made a fine return from injury, looked in ominous form against England. Her 90-run knock came off just 72 balls and was laced with 11 boundaries and two sixes. She might not have picked up any wickets against England, but Jhulan Goswami, the highest wicket-taker in ODI history, will lead the Indian bowling attack. 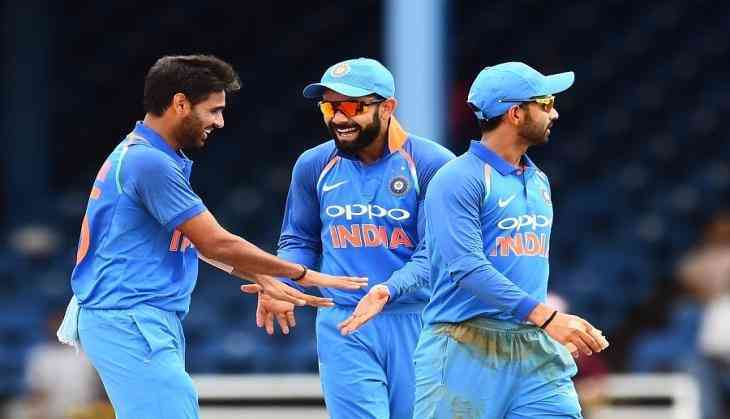 As far as their recent form is concerned, India comprehensively won their last four ODI series, first whitewashing Sri Lanka and the West Indies at home and then beating South Africa in the finals of the World Cup qualifier as well as the quadrangular series. Going by the outcome of their recent clashes, India will definitely start favourites against the West Indies. Meanwhile, in the other match of the day, defending champions Australia will play Sri Lanka. After the nine-wicket thrashing at the hands of New Zealand in their opening game, Sri Lanka too would be eager to get off the blocks but it is easier said than done against the title-holders. India: Mithali Raj (capt), Harmanpreet Kaur, Smriti Mandhana, Veda Krishnamurthy, Mona Meshram, Poonam Raut, Deepti Sharma, Jhulan Goswami, Shikha Pandey, Ekta Bisht, Sushma Verma, Mansi Joshi, Rajeshwari Gayakwad, Poonam Yadav, Nuzhat Parween. West Indies: Stafanie Taylor, Merissa Aguilleira, Reniece Boyce, Shamilia Connell, Shanel Daley, Deandra Dottin, Afy Fletcher, Qiana Joseph, Kyshona Knight, Hayley Matthews, Anisa Mohammed, Chedean Nation, Akeira Peters, Shakera Selman, Felicia Walters. The match starts at 3 pm IST.